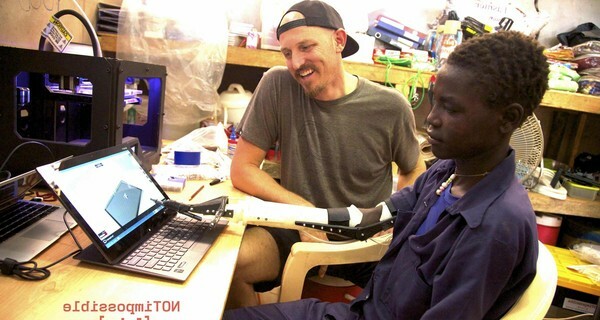 Project Daniel is the world’s first 3D printing prosthetic lab — located in the conflict zone of South Sudan. It was set up by Not Impossible founder Mick Ebeling after he saw footage of a teenager, who had lost both arms when a dirty bomb, full of kerosene and nails, went off while he was tending his parents’ cattle. The young man was Daniel Omar, a resident of a sprawling refugee camp called Yida. Ebeling tracked him down via the camp’s medic, Dr Tom Catena. In South Sudan, where even able-bodied daily life is a fight for survival, Daniel’s disability left him shell-shocked, ‘If I could have died, I would have,’ he told TIME magazine at the time. But in November 2013, he received a new arm, and fed himself for the first time, thanks to Ebeling’s Herculean efforts, plus the insight of a neuroscientist, a 3D printing company owner and the founder of open-source 3D printing prosthetic company Robohand Richard van As (whose designs were also a starting-point for the Enable community). It wasn’t an easy journey. Ebeling arrived in South Sudan as a ceasefire broke down. The team set up shop in a ramshackle tin shed where temperatures soared so high in the daytime that things began to melt. When they started to print at night tropical bugs, attracted to the machine’s lights, would jam up its mechanics. Daniel was physically in the room the whole time. ‘Every moment, I was staring at Daniel. We had to figure it out,’ says Ebeling. The project has a legacy beyond Daniel – Ebeling left two 3D printers in the workshop, in a community that had no concept of computers, let alone 3D printers before his arrival — and he’s trained locals to use them so that each week another victim of the conflict is able to get access to a limb, costing just hundreds instead of tens of thousands of pounds. ‘We’re hopeful other children and adults around the globe will utilise the power of this new technology for similar beginnings,’ he says.